The Philippine exclusive distributor of Falken Tyres, JM Far East, has launched the newest range of Falken high-performance and all-terrain tyres, the WILDPEAK M/T, WILDPEAK A/T 3W and AZENIS FK510-SUV at the Clark Marriott Hotel in Clark, Pampanga last January 25. 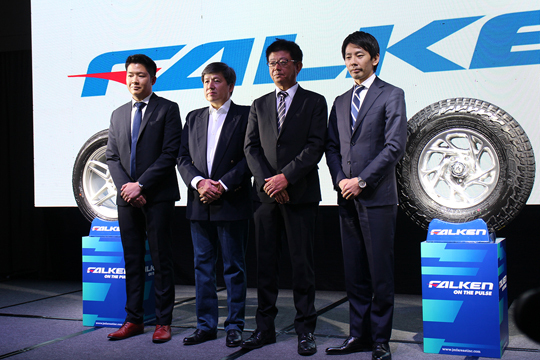 Executives of JM Far East present the new range of Falken high-performance tires. After the product launch and presentation, the Philippine motoring journalists together with Falken executives and dealers hied off to Sacobia River and Natural Hot Springs for an Off-Road Ultimate Experience with the new tyres, which were mounted on 13 4×4 vehicles. Falken is known as a leader in high performance tire technology for cars, trucks and SUVs all over the world. The company’s products were first launched in its native country of Japan in 1983. It started as a Sumitomo Rubber Industries brand, which was widely known for its innovative design, precision engineering and manufacturing quality for more than 100 years. During its inception, Falken was created as the flagship high performance radial tire brand. Three decades later, Falken has become a popular, stand-alone brand that focuses on high performance products while utilizing professional motorsports to further develop and improve its products globally. After ending their joint venture partnership with Goodyear Tires USA by the end of 2015, Sumitomo Tire and Rubber Company has pivoted its approached to the market through making FALKEN Tire as its strategic global brand by turning the brand to an Original Equipment supplier to major international automotive manufacturers like Mercedes Benz, Porsche, VW, Nissan, Subaru, and other known European car brands. Falken tires take the performance test during an off-road experience in the Sacobia River. Setting the need for continuous technological advancements as a priority, Sumitomo developed a superior ‘4D Nano Design’, which is their cutting-edge proprietary simulation technology that supports the development of new materials for high-quality, high-performance tyres such as the Falken. Utilizing the K Computer, one of the world’s most powerful supercomputers, 4D Nano Design combines ‘Investigation’, ‘Prediction’, ‘Production’ and ‘Extraction’ technologies to unlock the performance of new materials at the Nano scale, allowing the extraction of the maximum and even hidden potential of each material. Sumitomo’s proprietary ‘Advanced 4D Nano Design’ new materials development technology was selected for the prestigious ‘Tyre Technology of the Year’ award at the ‘Tyre Technology Expo 2017’ which was held in Hanover, Germany. Trusted by the pros to take on the harshest conditions, the tough WILDPEAK M/T is built to get you there and back whether you’re on the pavement, mud, snow or rocks. The M/T features Falken’s proprietary three-ply DURASPEC™ Sidewall Technology developed to sustain the most punishing off-road conditions. DURASPEC™ also features two high ply turn-ups that provide an additional layer of protection and durability. An aggressive upper sidewall provides additional traction at low air pressures on rugged terrain. The WILDPEAK M/T also features exceptional road manners thanks to an optimized variable three-pitch tread pattern and precision manufacturing technology making the tire amazingly quiet and comfortable even for daily use. It also features a Heat Diffuser Technology located in the lower side wall to dissipate heat and protect the tire internal components and ensuring vehicle stability even in towing and carrying heavy loads. WILDPEAK M/T is designed and tested in partnership with third party professionals including the biggest names in off-road such as the famous father and son team of Tony and Jordan Pellegrino.